The French art song or mélodie is quite different from the German lied. Where the German lied frequently involves long, uninhibited emotional outpourings, the French mélodie follows Debussy’s stipulation that “clarity of expression, precision and concentration of form are qualities peculiar to the French genius.” It is an art that is more objective, more intellectual than that of the lied, an art of suggestion in which feelings and emotions are refined and purified, an art that deals much more with sensitive impressions and perceptions than with direct emotions. Pierre Bernac, the great French singer some of whose recordings are reviewed below, has observed that “the Lied is essentially a Romantic phenomenon, whereas the French mélodie is post-Romantic and often reacts against sentimental effusion.” The mélodie, then, combines precision with lyricism to achieve a controlled profundity that does not preclude sensuousness of sound, beauty of sonority or subtle harmony. There is neither morbid introspection nor great moral high-mindedness here. Instead, we find that profundity is mitigated by a lightness of spirit and wit that are characteristically French. Then, too, the origins of the lied lie in folk song, echoes of which occur, for example, in the lieder of Brahms and Mahler. This intimate connection with popular song does not appear in the French mélodie. Some particularly fine recordings of the French mélodie have appeared recently, three of which are reviewed here. 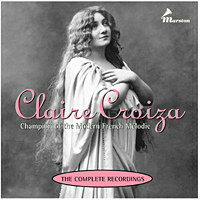 Claire Croiza was one of the great French singers of the earlier years of this century. Although she made her debut at the opera at Nancy as early as 1905, then at the Paris Opéra in 1908, Croiza did not record any of the many operatic mezzo roles or French songs in her repertory until 1927. Although she had at this point been singing for twenty-two years, her voice was then in fine condition and remained so until her last recordings made in 1936. Beginning in 1934, she taught at the Paris Conservatory, where her students included some of the finest French singers of the next generation — Jacques Jansen, Gérard Souzay, Camille Maurane, Janine Micheau, Suzanne Juyol and many others. Ward Marston, in a labor of love, has provided a great service to afficionados of French vocal music: He has gathered the complete recordings of Croiza in a two CD album (Marston 52018 – 2). This is no mean achievement, particularly in view of the scarcity of Croiza’s records. Victor Girard, in his accompanying notes, observes that “Three of them … are probably among the most elusive recordings in the world … .” Two of these “appear to exist in single copies now in private collections,” while another survives in what seem to be only two copies, “one in a private collection, the other in an institutional archive.” Here is an object lesson in the art of French singing in quite good, if slightly dry sound, considering the recording dates. The first disc opens with an excerpt from Debussy’s Pelléas et Mélisande (the beginning of Act I, Scene 2) with Croiza a sensitive Geneviève, and the fine bass Armand Narçon an authoritative Arkel. Two Schubert songs, the great “An die Musik” and “Wohin?” (From Die schöne Müllerin) are sung in French. Three Fauré songs, “Les berceaux,” “Claire de lune,” and “Prison,” are models of French song performance, the exquisite piano melody of “Claire de lune” one of the loveliest things in French song. “Prison” is an unusual song for Fauré. It is a setting of Verlaine’s poem recalling his own incarceration for the attempted murder of his friend Rimbaud. Croiza perfectly captures the personal bitterness, hopelessness and drama so rare in Fauré’s songs. A fine, serious reading of Poulenc’s Le bestiaire, with Poulenc himself at the piano, is revealing. Poulenc plays the grace notes in “La carpe” before the beat and slows his pace where the score does not indicate this. It is colorful playing. Duparc’s “L’invitation au voyage,” one of his finest songs, is sung directly, the exquisite nostalgia of the poem perfectly captured by Croiza, with Poulenc a fine partner at the piano in a coruscating accompaniment. With Poulenc again at the piano, Croiza gives a vital performance of Debussy’s “Il pleure dans mon coeur” from his Ariettes oubliées, set to Verlaine’s poem. Songs of Arthur Honegger (with Honegger at the piano) and excerpts from his opera Judith, along with songs of Roussel (with Roussel at the piano) and Pierre de Bréville round out the first of the two discs. De Bréville (1861-1949) has been all but forgotten in recent years, though his songs, along with his opera Eros vainqueur, were critically acclaimed at the time. Croiza sang the title rôle in the opera’s première in Brussels in 1910. Five of his songs are sung here by Croiza, with de Bréville providing the accompaniment. (He is known to have composed 105 songs, some never published, between 1879 and 1945). In the first of these de Bréville songs, “Une jeune fille parle,” Croiza exquisitely spins out the long melodic line. In all of these, she marvelously captures the mood of each song. The Honegger Judith, composed in 1926, provides a startling contrast. This is an intensely dramatic, modern work in which Honegger uses a speaker to objectivize the drama in a way analogous to the use of the narrator in Protestant oratorio. The manner in which he uses the voice to alternately speak, whisper, scream, hum or murmur has been quite influential, and these excerpts (which continue on the second CD) are exciting glimpses of a rarely heard work. Croiza is extraordinarily expressive in these, both singing as Judith and reciting as the speaker. For a time, Croiza maintained a liaison with Honegger and bore him a son. Fauré’s “Soir” is sung more slowly than in almost any other recorded performance. Croiza’s technique here is not flawless — a few broken phrases and an imperfect top are essentially redeemed by her fine sense of the subdued mood of the song. Duparc’s “Chanson triste” is here intensely personal, elegiac, intimate, though Croiza occasionally runs out of breath. Fauré’s “Après un rêve” gets one of its fastest recorded performances, totally unsentimental but sensitive , the song’s yearning intensity perfectly captured. Evidently, Fauré himself told Croiza that the song should be sung “without slowing down,” and she learned the lesson well. Duparc’s “Chanson triste” gets a highly intimate interpretation, as does his “Lamento,” where Croiza, unlike other interpreters, carefully respects the composer’s markings and gives much the best performance of this song on record. Her pianissimos here are beautifully expressive. It is a shame that she did not get around to recording Duparc’s complete song output (consisting of just fourteen songs). Two songs of the sadly neglected composer Déodat de Séverac (referred to here as Joseph de Séverac), “Ma poupée chérie” and “Albado” (or “Aubade”) receive straightforward, sensitive performances. They also appear on the Hyperion disc of songs by Séverac reviewed below. Croiza also performs songs of Debussy, Roussel, and Caplet here. These are all models of style in the singing of French song. Finally, she reads excerpts from some long free-verse poems of the Catholic mystic poet Charles Péguy (1873-1914), as well as from Racine’s play Esther. Translations for these readings (but not for the song texts) are provided. Croiza’s expressive voice, superb diction, and fine sense of style, made of her an ideal interpreter of French song. To anyone interested in the genre, these recordings are invaluable. Pierre Bernac (1899-1979) was the most important exponent of the French mélodie of his generation. He exerted a wide influence on the next generation of interpreters of this elegant art — the gallery of his pupils included Gérard Souzay, Elly Ameling, Kathleen Ferrier, Mattiwilda Dobbs, Bernard Kruysen, Jessye Norman, and Felicity Lott. From 1940 to 1960, Bernac’s position among French singers was much like that of the legendary Claire Croiza in an earlier time. Bernac was entranced by the conjunction of music and poetry in the French tradition, and his singing was in a sense merely an extension of human speech, placing extraordinary emphasis on perfect diction. Graham Johnson, the pianist who recorded Poulenc’s L’histoire de Babar, le petit éléphant with Bernac observes in his informative notes accompanying the recording reviewed here, that Bernac had told him that “he had only become a singer in order to declaim the poems he loved with heightened intensity.” Bernac’s voice was not a conventionally beautiful one — here is not the mellifluous, honeyed smoothness of a Heinrich Schlusnus, for example. Bernac’s voice is a relatively light baritone martin (a characteristically French high baritone). His extraordinary musical intelligence, vast range of vocal color, elegance and real individuality, combined to produce singing of great beauty of line and musicianship. In direct comparison of Bernac’s recordings of French songs with those of other singers, almost invariably he achieves a perfection that somehow eludes the others. Bernac’s belief in the need for performers to introduce the works of contemporary composers resulted in many engagements in which he presented the premières of some of the finest French songs then being written. In 1926, for example, at Poulenc’s request, Bernac gave the first performance of Poulenc’s Chansons gaillardes (with Poulenc at the piano). This was an enormous success, and eight years later, when Bernac and Poulenc were both in Salzburg (Bernac studying the German lieder repertory with Reinhold von Wahrlich and Poulenc reviewing the Festival for the French newspaper Le Figaro) Bernac needed an accompanist for a Debussy recital. He invited Poulenc to take on the job, and thus began a famous association that lasted for a quarter of a century. Most of Poulenc’s songs from that point on were specifically written for Bernac. Among the song cycles that Poulenc set for Bernac are Tel jour, telle nuit, Le travail du peintre, Caligrammes, and Le fraîcheur et le feu. In their collaboration the two always felt that the singer and the pianist were to be regarded as equal partners, much as was later the case with Peter Pears and Benjamin Britten. In an indispensable album of three CDs, Testament has brought together Bernac’s recordings of songs of Gounod, Chabrier, Duparc, Chausson, Roussel, Fauré, Debussy, Ravel, Satie, Poulenc, and Milhaud. Included, too, are songs by the much less well-known composers Pierre Vellones and Louis Beydts. The German lied is also represented in previously unpublished recordings of Schumann’s “Dein Angesicht,” as well his song cycle Dichterliebe. Gerald Moore is the fine accompanist in the Schumann songs. Three German songs by Franz Liszt round out the collection, appropriately entitled The Essential Pierre Bernac (Testament SBT 3161). Not included in the collection are the recordings Bernac and Poulenc made for Columbia Records in the United States in the early 1950’s nor those made later for Véga-Adès. Many of these might also well be considered “essential,” but the present collection originating with EMI contains an embarras de richesses even without them. Unless otherwise specified, Poulenc is at the piano in all of these. The first disc opens with Gounod’s “Sérénade” in a performance that easily outclasses all others. This lovely setting of Victor Hugo’s love poem consists of three stanzas set to the same music. The challenge in its interpretation is to properly vary the dynamics and the tone color from stanza to stanza, which Bernac fulfills admirably. As always, his diction is superb. The range of color he achieves is impressive. The partnership between Bernac and Poulenc is one of perfect mutual understanding and support. Duparc’s “Soupir” is a song of lovelorn anguish. Its intensity of feeling and great sadness are beautifully captured in a reading of extraordinary sensitivity by Bernac and Poulenc. The quiet heartbreak of the final utterance, “toujours,” encapsulates a whole world of feeling as few singers have done. Duparc’s “L’invitation au voyage,” set to a poem of Baudelaire, is one of the greatest of French mélodies. Sydney Northcote, in his book The Songs of Henri Duparc, observes that “the exquisite nostalgia of the poem is translated into an unimpeded music, the vocal phrases rising like tall, swaying flowers out of a shimmering musical texture.” Bernac sings this with a passionate immediacy. Chabrier’s “L’île joyeuse” is a joyful song, and Bernac brings to it a warm spontaneity and passion, along with perfect phrasing. Chausson’s “Le colibri” receives an unsurpassed performance of extraordinary sensitivity and great tenderness. It stands as a model of French singing. Roussel’s “Le jardin mouillé” is beautifully sung, Poulenc’s fine accompaniment suggesting the dripping of rain. Bernac was also an exponent of the German lied. Here he performs Schumann’s “Dein Angesicht” and his song-cycle Dichterliebe. Although he recorded Dichterliebe for American Columbia Records (with Robert Casadesus) in 1952, this is an earlier recording from 1950, with Gerald Moore at the piano. It has surprisingly remained unpublished until now. It is an intensely personal reading, one of great emotion, and, as always with Bernac, perfect diction. In “Ich hab im Traum geweinet” Bernac gives us as profoundly sad a reading as I can remember — one can almost hear him weeping. In all of the sixteen songs of this cycle, he is that much more immediately involved, more capable of communication than most other singers. It is a performance not to be missed. His rendering of three Liszt songs more than attests to Bernac’s credentials as a singer of the German lied. This first, generously filled CD, concludes with songs by Darius Milhaud, Pierre Vellones (1889 – 1939), and Louis Beydts (1895-1953), whose four songs from the cycle La lyre et les amours are accompanied by orchestra. The second CD opens with six songs of Fauré, all sung with the careful attention to both the text and the composer’s score markings that are so characteristic of Bernac’s art. Seven songs of Debussy follow, including the Trois ballades de François Villon, which receive suitably intense performances from Bernac, the third of these songs, “Ballades des femmes de Paris” bringing a perfect touch of mischief. Two songs of Satie, “La statue de bronze” and “Le chapelier” bring a delightful impudence, and Ravel’s Don Quichotte à Dulcinée receives a colorful reading. The remainder of this disc is devoted to two dozen songs of Poulenc, with more of them on the third disc. These recordings (with Poulenc at the piano) merit the word “definitive,” if any do. There is an amazing variety of style in Poulenc’s songs — as Martin Cooper notes in his book French Music, Poulenc is “a musical clown of the first order, a brilliant musical mimic and an adroit craftsman who pieces together the most heterogeneous collection of musical styles to form an unmistakable personal style of his own.” This ability to combine and synthesize what at first might seem contradictory elements enables Poulenc to provide the perfect musical setting for the surrealist poets, particularly for Paul Éluard. The serious side of Poulenc is manifest in his setting of Éluard’s verses in the fine song-cycle Tel jour, telle nuit. From the quiet loveliness of the first song “Une ruine coquille vide” to the shock of “À toutes brides” to the ardor of “Je n’ai envie que de t’aimer …” or the intensity of the final song “Nous avons fait le nuit,” every mood is perfectly captured by Bernac’s simple, yet subtle art, with Poulenc the perfect collaborator. The delightful cycle Le bestiaire (to poems of Guillaume Apollinaire) was composed by Poulenc at the age of twenty. It is a polished musical portrait of the dromedary, the Tibetan goat, the grasshopper, the dolphin, the crab and the carp. Deux poèmes de Louis Aragon provide a striking contrast of mood. The deep sadness and long line of Bernac’s “C” are suddenly succeeded by the catchy earthiness of “Fêtes galantes.” This element of stark contrast appears again when “C’est ainsi que tu es,” the second song of the cycle Metamorphoses, a tender love song beautifully caressed by Bernac, is followed immediately by the audaciousness of “Paganini,” the third song of the cycle. The third disc brings nine songs of Gounod, which deserve more frequent performance. Surprisingly, Gounod wrote some two hundred songs under the influence of Schubert, Chopin, and Mendelssohn. The best of these are undoubtedly the earlier ones, written before 1870, for after this time, the genuine charm was to some extent replaced by a banal sentimentality. But some of the songs are really excellent, with a freshness and simplicity that make them worth hearing. Certainly, Gounod had a strong influence on later composers of French song. Bernac makes as fine a case for these as can be made. It is interesting to hear Mignon’s Song “Connais-tu le pays,“ better known, of course, in the Hugo Wolf setting as “Kennst du das Land.” In “Venise,” the rocking piano accompaniment suggests the lapping waters of the canals. These Gounod songs are followed by Poulenc’s song-cycle Le travail du peintre, set to poems of Éluard about seven modern painters (Picasso, Chagall, Braque, Juan Gris, Paul Klee, Joan Miró and Jacques Villon). Then follows a fascinating, revealing interview of Bernac (whose English is perfect) by Graham Johnson, recorded in 1977, along with a performance of Poulenc’s charming “L’histoire de Babar, le petit éléphant,” in which Bernac narrates the story in the original French, to Johnson’s marvelous piano accompaniment. This is sheer delight! The French text and its English translation are provided, as are text and translations for all of the songs in the collection. This album is a priceless compilation of great French singing and is not to be missed! It is one of the gems of the song literature. In the early twentieth century, the French composer Déodat de Séverac (1872-1921) was regarded as the third man in a triumvirate consisting of Debussy, Ravel and Séverac, so high was his reputation. But Séverac, who died at the early age of forty-nine, suffered a fall into relative obscurity when the roaring twenties came to see his interest in the local folk songs of southern France as too provincial for minds attuned to the sophistication of a Diaghilev or a Cocteau. The recent formation of a Séverac Association in France and a festival of his music, along with several new recordings would seem to indicate a welcome revival of interest in this unjustly neglected composer. Séverac preferred living in the region in which he was raised and, in fact, visited Paris only for professional reasons. For most of his life he lived in Céret or St Félix, with his inspiration provided by the beautiful Languedoc landscape, its villages and the local folk musicians. Influences on Séverac’s works include Mussorgsky (who also influenced the work of Debussy), Debussy himself, Bizet, Chabrier and Ravel, who shared both Séverac’s infatuation with Spain and his attraction to Basque folk music. An interesting CD contains twenty-seven of Séverac’s songs in fine performances by the baritone François Le Roux, with one of them, “Ma Poupée Chérie” (“My Dearest Dolly”) sung by Patricia Rozario and another, “Chant de Noël’ (“Christmas Song”) sung by both Le Roux and Rozario. The disc is part of Hyperion’s French Song Edition, a worthy enterprise that has brought discs containing the best of French art songs. The series is under the aegis of the redoubtable Graham Johnson, whose piano accompaniments, fascinating in themselves, could not be bettered. As in the Hyperion Schubert Lieder Edition and other song recordings in which Johnson has participated, his accompanying notes are extensive, informative and scholarly far beyond the usual. This disc comprises both Séverac’s pastoral songs redolent of the atmosphere of country life “in the shadow of the Pyrenees” as well as the cheeky folk song arrangements he prepared for the famous diseuse Yvette Guilbert. A composer of surprising variety, vitality and range emerges. This is not music of the perfumed salon. The CD opens with the sprightly “Ritournelle,” one of Séverac’s earliest songs, and one which may well be a conscious tribute to Berlioz, who gave the mélodie its name and whose “Villanelle” (the opening song of Les nuits d’été) this mélodie recalls. This is followed by “Renouveau” set to a poem of Charles d’Orléans (1394-1465) which was also set later by Debussy and Saint Saens. Séverac’s essentially modal setting is lovely. Le Roux sings here as in all these songs with a subtle sense of style, carefully characterizing and differentiating the mood of each song. One of the most tuneful songs on the disc is Séverac’s arrangement of the traditional “Le roi a fait battre tambour” (“The king ordered the drum to be beat”). This is an exciting strophic song in which Séverac imaginatively uses the texture of piano sound to suggest the rattle of a drum. Le Roux’s marvelous sense of style brings enormous variety to the varying interpretation of the repeated strophes. “Un rêve” is based on a poem of Edgar Allan Poe, translated into French by Mallarmé and displays the influence of Debussy’s Pelléas et Mélisande. Séverac here evokes a dreamy world of soft murmurings, sung over an accompaniment of quietly undulating dotted triplets — a lovely song. So also is “Chanson de la nuit durable” (“The song of night without end”), a beautiful love song exquisitely sung by Le Roux. The sharp contrast between the dreamy sensuality of this song and the catchy froth of “Le cotillon couleur de rose” (“The pink skirt”) which follows it is an indication of the care and intelligence with which Graham Johnson has planned this recording. “Chanson de Blaisine” sounds almost improvisatory in its folk-like character. It is one of Séverac’s incidental pieces for the theatre, and its accompaniment in performance may well have involved the use of bells, one of Séverac’s great interests. “Ma poupée chérie” (“My dearest dolly”) sung by Patricia Rozario verges on sentimentality but is a lovely melody. Graham Johnson regards the last song on the disc “A l’aube dans la montagne” as perhaps Séverac’s greatest. The exquisite poem is Séverac’s own and more than justifies his literary abilities, while the complex bell sonorities he pursues in the piano part attest to his skill in composition. A wonderful song! Séverac still remains relatively unknown. Though he is briefly mentioned in David Cox’s chapter on French song in A History of Song, Revised Edition, edited by Denis Stevens, Séverac surprisingly is accorded no mention in the long article on the mélodie in The New Grove Dictionary of Music and Musicians. This recording fills an important gap in the repertory and hopefully will help restore a sadly neglected composer to prominence.